A couple days ago I told you to be a buffalo—so I thought I’d follow it up with be a minion. That’s right—be a minion. Not the scary purple guys with the wild hair and psychotic twitch, but the nice yellow ones like Kevin. He’s my favorite if it’s possible to have only one favorite minion. Okay, in truth. He’s the only minion’s name I remember and the only one that Gru seems to call on all the time. So if he’s good enough for Gru…well, you know the rest. Anyway, why should we all be like Kevin? I just finished watching Despicable Me II and it was fantastic. It’s like a Shrek. It keeps getting better or at least staying just as good. I won’t give away any spoilers in case you haven’t seen it yet, but those little yellow guys get beat up terribly. Who wouldn’t want to be a minion? I want to be a minion! Categories: General Posts | Tags: Despicable, Despicable Me, Don Shomette, Minioin, SRO, SRO Toolbox | Permalink. Recently I was in Missouri teaching the course The Principals of School Safety. I was getting ready to head to class and stopped in the hotel lobby to grab a quick breakfast. The news was on and a reporter was describing how a local school district was installing bullet proof chairs to make their schools safe. I grabbed a seat and watched as the reporter even demonstrated how to use a chair as a shield by turning it around and hiding behind it. She then took off the chair covering and put it on like a bullet proof vest. Here’s what was wrong with the news story…and it has nothing to do with the bullet proof chairs. Well, a little bit to do with the chairs. It’s really what the reporter said, how she said it, and the message conveyed behind her words. These are events. Having a safer school is a process and not an event. When I graduated from boot camp and became a Marine—that was an event. When I graduated from the police academy and became a certified police officer—that was an event. Getting married—event. First child born—event (I’m proud to say that I’ve celebrated that event with my wife eight times). Becoming a terrific leader—process. Living a happy life—process. Being physically fit—process. Being a great husband and father—process. Having a safer school—process. We can’t think that just one thing will make our schools safe. Unfortunately, it’s not how it works and that kind of mindset in the end will only make us less safe! A process is something that we have to continue to tweak, evaluate, and implement on a daily basis—and even sometimes when we don’t want to. Deciding to change is an event—maintaining that change is a process and solid processes are the answer to a safer school! For the record, there is no space that we can make completely safe—only safer. And as far as bullet proof chairs go, they might help or hurt a school. It’s hard to say. Just like people, each school is unique and when it comes to saving lives, a cookie cutter approach should not be used. The only way to know for sure would be to individually assess each school and determine the overall value of the security measure—in that particular school at that particular time to make it safer. Categories: General Posts | Tags: Don Shomette, school professional development, school safety, school security, SRO Toolbox, The Principals of School Safety | Permalink. In Colorado, the worst winter storms always come from the west over the Rockies. When the cows in Colorado see the storm, they will turn east and run as fast as they can away from the storm. Not being overly quick or nimble, they are easily caught by the storm and since they are running in the same direction, the ice and snow continues to pound them for a long time—longer than it would have had they just stayed put and taken it. When they see the storm, they will run west, face first into the storm. While they are still pounded by the ice and snow, theirs is a shorter pounding and all things being equal—a much smarter way to weather a storm. What a valuable lesson in life as well as threat assessment. That’s right, as crazy as it sounds, threat assessment. When your school is faced with a threat, don’t just stand there and let it pummel you. And never ever run with it—it will only prolong your misery and add immensely to your chances of being hurt. Instead, turn face first into it. Keep your eyes open, find the facts, and get through it. The single best way of getting through it is to find the switch that is fueling the unwanted behavior and turn it off. Meet the need of the student who poses the threat and that’s the best way to quiet the storm. Sometimes you can’t stop a storm, but you can always decide how you will respond to it. 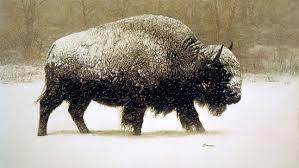 So, be a buffalo…if nothing else, it’s better than being a cow. Print out a picture of a buffalo and put it in your office. Let it remind you of the best way to face storms as well as serve as a ‘talking’ point with students and staff. When they ask you, “Why do you have a picture of a buffalo?” You can educate them and tell them the benefits of being a buffalo in a storm. Categories: General Posts | Tags: Assessing Threats of Violence, Don Shomette, Human Threat Assessment, school safety, School Vulnerability Assessment, SRO Toolbox, Threat Assessment | Permalink. This statement struck me as odd, but I didn’t give it much thought. After all, I knew what he was trying to say. Failure can lead to success if you learn from your failure. I get that and totally agree with it. I had every intention of moving on, but then the same message kept popping up in every CD. It was like I couldn’t get away from it. And each time I heard someone talk about failure, it made me feel more and more uneasy so I started to listen very closely. Then I got it. Their message wasn’t that we should learn from our mistakes, avoid making the same ones in the future, and get back up on that horse and try again. Their message was something completely different. My first thought went to all the students who failed school this year. I wonder if they or their families would agree. I certainly don’t because there is no intrinsic value in failing—none. There never has been and never will be. Failure is a bad thing. And it’s certainly not a prerequisite to success. Just ask the 70% who will be rearrested this year after being released from prison. I don’t think they would see the positive in it. Now, having said all of this, there is no doubt that good can come from bad. Happens all the time. But it doesn’t come because the person has failed and it’s certainly not automatic. Good things will only come if we add another ingredient. If we see failure for what it is—something to be corrected instead of celebrating—then we’re more likely to act. By taking action to correct the failure we’re using perseverance. Perseverance is a virtue and all virtues are intrinsically good. Good for the person and good for others. Perseverance is incredibly powerful and changes lives. 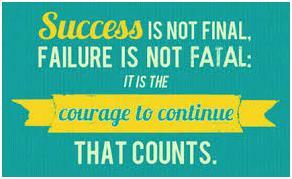 It keeps you going when you feel like quitting and is a prerequisite for success—not failure! Chances are you have students who have failed this year. Our goal should be to jump start their perseverance—to get them moving and to keep them moving in the right direction. If you still have time before school starts, call or visit the student and parents. Let them know that you are there to help. If you don’t tell them otherwise, they may feel as if you think less of them. Let them know that’s not the case and show them that you care with a quick phone call or better yet, a visit. Failures most often occur not because of something, but because something is missing. Clear direction, the right motivation, proper knowledge, good friends, and the list can go on and on. Technology is a great help—use it. Put a reminder on your calendar and set it to remind you every other Tuesday to check on your students. Just a quick face-to-face to make sure they’re doing okay. If you really want to ‘wow’ a student, visit with their teachers beforehand. Then, recite their grades or the comments their teachers are making about their improvement or what still needs to be accomplished. Not only are you giving them a little bit of your day, but now you’re also proving that you’re willing to go the extra distance. Sound like perseverance? You betcha and now they have an example of perseverance—everyone wins! When you meet with them, turn everything off and focus only on the student. Be there fully. Look them in the eye, laugh with them, listen to them, let nothing else draw your attention away—what you’re doing is a privilege and not a chore so treat it like one. Little successes lead to big successes. Encourage them to keep going forward, even if only day-to-day. Another highly successful program lives by this motto. Just ask anyone who’s completed Alcoholic Anonymous. That difficult journey is one never ending act of perseverance that is measured daily. Sometimes that’s the best we can do. What? Are you serious? In the ancient world it was known as joining ‘heart-to-heart’. It means that my miseries are your miseries—that we will share this together. Sharing in someone’s troubles is an act of mercy. The second name of mercy is love and love is the world’s greatest good. Let them know you care. Finally, a million failures don’t add up to a single success. Failure is just failure, unless it’s followed with effort. So, if you’re going to celebrate anything, celebrate effort. Categories: General Posts | Tags: celebrate failure, Don Shomette, school professional development, school safety, self-help, SRO Toolbox | Permalink.